1,300-year-old press found in Israel's first capital will be open to families on Hanukkah to press oil and renew the tradition. During the latest archaeological excavation season at Tel Shiloh, the site of the Mishkan (Tabernacle) that preceded the Holy Temple in Jerusalem, an impressive ancient olive press was found in the southern portion of the site. The press, found in an excavation led by Dr. Ofer Gat, was dated to the early Muslim period of conquest from the 7th to the 10th century CE. While the press has not been excavated to completion yet, the large structure is already apparent and it is clear it was used as a public olive press. The newly discovered press joins a previously unearthed olive press located adjacently, which was found during the summer of 2011. 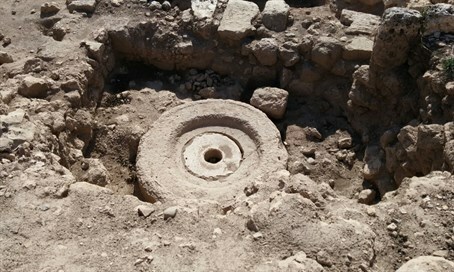 The formation of olive presses located adjacent to or connected to each other is a known feature from the Muslim occupation of the holy land, as seen in additional sites throughout Samaria, and bears testimony to the public nature of the facilities as well as the importance of olive oil in that period. Opposite the entrance to the olive press structure in a courtyard area, an enormous storehouse was found with burned olive pits. In addition, the remains of clay candles and glass cups typical of the period were also found. The discovery of the olive press testifies to an historical continuity in the production of olive oil in the Binyamin region of Samaria in general, and in the region of ancient Shiloh in particular. This coming Hanukkah, which celebrates the miracle of olive oil lasting eight days in the Temple after the Maccabees defeated the Greek occupiers over 2,000 years ago, ancient Shiloh will renew the production of olive oil. During the holiday an oil harvest will be held for those wishing to take part, with families invited to come harvest olives, press oil at the ancient press, fill bottles with the oil and other activities at the ancient city that was the capital of Israel for 369 years, back over 3,000 years ago.